MasterBundles offers a huge discount for premium modern vector watercolor alphabet. A full alphabet of latin letters and digits in a variety of styles will fit both digital products and printed items. Grab this pack of professionally crafted vector items with 96% discount. If you need a visually effective text or a headline that will grab attention, this modern vector watercolor alphabet will come in handy. It perfectly fits all types of text presentations on the web and in print products like posters, banners, flyers, business cards, etc. If the content is a king, give it a decent presentation with this pack. All elements come in .AI / .EPS formats, so you can easily scale them and their quality will remain unchanged. Do not settle for less in quality and your design. Choose only the best solutions! Get this premium modern vector watercolor alphabet just for $10. Are you looking to give your project a touch of unique creativity? There are a lot of decorative fonts and vector alphabets on the web to help you spice things up. But the downside is that even if you find one that suits your needs – you will have to customize it until you get the look you wanted. Not to mention that it can also be quite pricey! 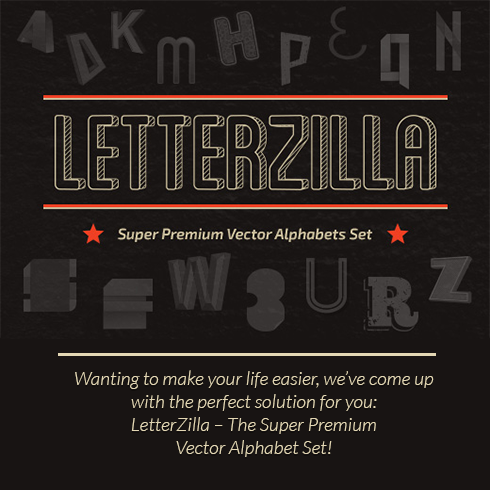 Wanting to make your life easier, we’ve come up with the perfect solution for you: LetterZilla – The Super Premium Vector Alphabet Set! 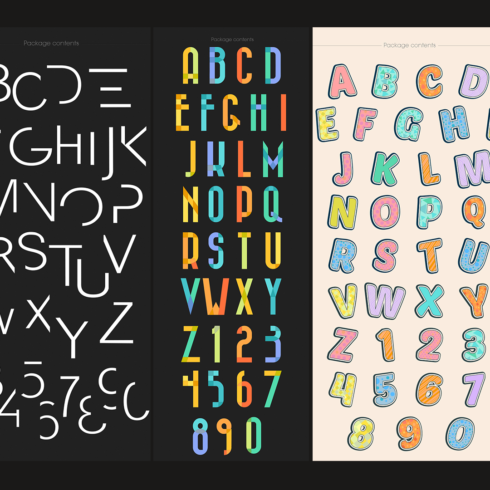 Hundreds of hand-drawn letters and numbers divided in 19 of the most used categories, such as: retro, vintage, flat, minimal, origami, 3D, paper and more! Each of these 19 sets contains the full alphabet and numbers from 1 to 9 (with zeros included where necessary). Expanded .Ai and .EPS files that are perfect for both print and web design. Can be used as headlines, display texts, in posters, stickers, flyers and pretty much anything you can think of. Easy to use and perfect for both beginners and pros. An extended license, allowing you to use them in an unlimited number of personal and commercial purposes and in merchandise. 200% money-back guarantee. If these sets don’t rise to your expectations, we will give you all your money back and on top of that keep the source files! And wait till you hear the price! Usually you would have to pay $15 for each set, meaning a total of $285, but exclusively on MasterBundles you can get the whole bundle for just $21! With a massive 95% off, this is a must-have for any designer out there! What Are Fonts and Why Are They Crucial? A web font is a range of signs of a particular size and style that shapes a single thematic and structural unit. The main purpose of any font is to get the audience’s interest with its design and shade and get him to read the written text. A well-made font allows you to present not just the written text but even a particular atmosphere. Trendy and unique fonts are more expressive and more noticeable, so every business tries to regularly use its original one as an important element of their brand. 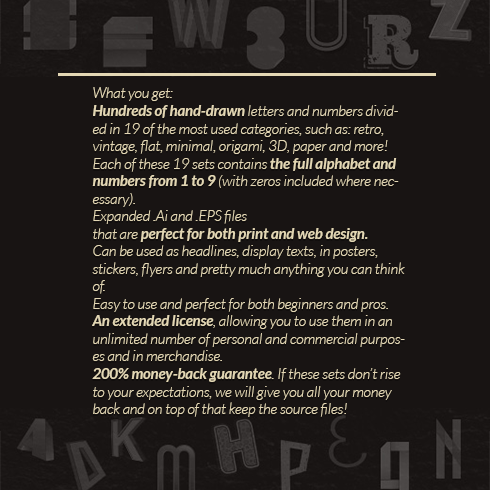 The cost of custom fonts usually ranges from totally free to over hundred dollars. There are 5 types of fonts. Serifs are more typical, they can be easily recognized via tiny lines attached to characters. Sans-Serifs are a modern type, and characters are lacking small “feet” on their ends. Slab-serif fonts are generally chunky and blocky, they add substance to the overall design. Scripts look like hand-writing and also have interweaved letters. Stencils are identified by rounded edges and thin strokes, utilize them to make an artistic headline. The Definition Of Bundles and What Is The Cost? A web font bundle is basically a range of multiple two to fifteen web fonts offered at a significantly cut down price. One of the benefits of purchasing units is that they cost you just a little bit more than an individual font does, provided they are on sale. The average cost of a web font set on our website is only two to twenty dollars. However, be fast: the life cycle of every bundle lasts only 5 days. How Do Fonts Influence The Perception of the Service? In the case of creating advertising banners, one should choose a font rather thoroughly. Promo banner developers should choose those types of web fonts that will match the feeling of their ad. The web font itself does not simply carry info but also fills it emotionally, provided one is chosen properly. Generally, the advertising text gives the person a sense of the company’s service, which means a well-chosen web font will only contribute to the desired visual impression. I Have Not Found Any Suitable Fonts in This Package. What to Do? Do not worry! MasterBundles.com has tons of various bundle options for different events and designs. Just check out our website and you’ll definitely discover something to your taste and requirements. Apart from font bundle deals, MasterBundles features many spectacular bundles. Check out image bundles, icons, textures and patterns, web site theme bundle deals. There are also e-books and courses, stock photography, logos, illustrations and add-ons, mockups, as well as other categories. We’ve got thematic Xmas and Valentine’s bundle deals, post cards and presentations. And, not surprisingly, our most popular under $5 deals! Masterbundles is an internet marketplace. On our website, pro web designers promote their creations at the best prices. This site offers the best deals out there, and our bundles are well praised by buyers. Take a look at our blog, it truly is loaded with practical content for successful designers. Furthermore, in case you subscribe to our newsletter, you will be the first to know about our special discounts. There are always coupon codes and promotional codes offered to lower the price to a minimum.